Grey seal adults may be up to 2.5 metres in length and weigh up to 250kgs, with males tending to be larger than females. The coat colour is variable shades of grey, brown and silver with the back tending to be darker than the underside. Males tend to be darker than females and also have a noticeably arched "Roman" nose, whereas a female's nose has a straighter outline. Male grey seals reach sexual maturity at 6 years, Females at 3 to 5 years. The latter give birth to their pups in the Autumn and early Winter. The first British pups are born off the Scillies and Cornwall in August and September and the time of pupping is progressively later as you move clockwise around the British Isles, the latest pups being born off the east coast of Scotland and the Farne Islands in late December. 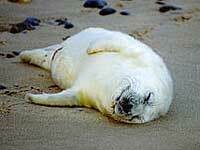 At, birth, grey seal pups weigh about 13 kg. and are covered in long, creamy white hair. A bond is formed between mother and pup at birth, and a mother can recognise her pup from its call and smell. For the first three weeks of their lives, pups rarely swim, suckling from their mothers 5 to 6 times a day, for up to 10 minutes at a time. The milk is rich in fat and the pups rapidly put on weight. The mother tends to remain just offshore between suckling bouts and rarely feeds, losing up to a quarter of her body weight before her pup is weaned. Grey seal pups are weaned after losing their baby coat at 3 to 4 weeks of age. At this point, they weigh 45 to 50 kg; three times their birth weight. The pups live off these fat reserves whilst learning to feed, which may take several weeks. The adult females (″cows″) become fertile soon after weaning their pups, mating with the adult males (″bulls″), who hold territories during the breeding season and may mate with over half a dozen cows. Mating can take place on land or in water and pregnancy last for 11.5 months, there being a period of 3.5 months when the fertilised embryo does not attached to the wall of the uterus and its development is arrested ("delayed implantation"). As a result, pups are born at the same time each year. 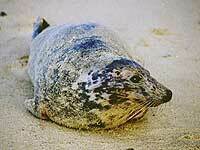 Grey seals moult annually in the spring, 3 to 5 months, after the end of the breeding season. In the wild, males may live for about 25 years, females for about 35 years.